On the ship, there are two science watches: noon to midnight (day shift) and midnight to noon (night shift). I am assigned to the day shift. We left port late Tuesday afternoon, but we made it to our first trawl site a few hours later. When the nets brought back our first haul, I had a crash course in sorting through the fish. The fish come down and conveyor belt from the back deck to the wet lab. In the wet lab, the first thing we do is sort through the fish. The more experienced scientists are at the front sorting through the larger species and sometimes the more abundant ones. The largest species of fish go in large baskets, the medium sized ones go into large buckets, and the smaller ones go into smaller buckets. Each basket or bucket only has one species in it. During our first trawl, there was a smaller amount of fish to sort through, but we had a lot more fish the second trawl. It took us longer to sort through the larger fish. Once the fish are sorted, we go to our cutter/recorder stations. At our stations, we sort through the buckets of fish one by one. Right now, I am a recorder. This means that I record the information about each fish into the computer. It’s a really cool computer system. First, the bucket it scanned. On the computer screen, a message pops up to tell us what type of fish should be in the bucket. If that is what we have, we say “Yes” to the prompt and continue. Then, we dump the contents of the bucket into a well waiting for inspection. The cutter pulls the fish out, one by one, and begins to take measurements. The first measurement is usually length. The tool for taking the measurements is integrated into the computer system. The fish are laid out on the ruler, and a sensor is tapped at the end of the fish. This sends the fish’s measurement to the computer. The Fish Measuring Board is a magnetic system. The tool that we use to measure the fish is a magnet. The board is calibrated so that when the magnet touches a specific area of the board, it will read the appropriate length. The computer then tells us what measurement to take next. Usually it is weight. On the other side of the Fish Measuring Board is the scale for the larger fish. There is also a small scale for smaller specimens. When the weight is recorded, the computer then prompts for additional measurements which are taken from the fish. During our second trawl, we worked up a bucket of summer flounder. One of the summer flounder was huge! I had not seen a flounder that big before! One of the things that has really impressed me so far is the integration of the science and the technology. The computer system that records measurements is integrated into the ruler and scale right at the work bench (the fish measuring board). When we take samples from the specimen, a label is printed right at the station, and the sample is placed into either an envelope, zip bag, or jar for further handling. It reminds me of how technology makes the job of science more streamlined. I can’t imagine how long it would take for the processing and sampling of the fish if we had to take all of the measurements by hand! Technology is a valuable tool for scientists at sea. We left port on Tuesday, September 23. Before we left, I had a chance to explore the ship and ran into chief engineer Craig Moran. He sent me to the engine room for a tour, and I met John Hohmann. John is the first engineer on the Henry Bigelow. He showed me around the engine room including the generators, the water system, and the shaft to the propeller. It was pretty quiet in the engine room since we hadn’t left yet, but it is a loud, warm place when the ship is at sea. I had a chance to chat with John about his background in engineering. He has a specialization in marine engineering. Marine engineers really need to be a jack-of-all-trades when we are out at sea. If anything is not working right on the ship, they are called out to fix it. This can include any of the machinery in the engine room, the electrical systems, the water purification system, and even fixing the cooking equipment in the galley! Life at sea can be demanding as they can be called at any time day or night to fix an integral piece of machinery. However, engineers generally work 30 days at sea and then are home for 30 days. One thing John wanted you all to know is that there will always be jobs for engineers. If you are interested in marine engineering, it can help you travel the world. John has been all over the world to many interesting countries. The other thing that I found interesting is that he says you need to be able read and follow instruction manuals in order to fix an issue. He also said an essential skill for an engineer is problem solving. Marine engineering entails a lot more than I had initially thought, and it is really cool to be able to talk to John and learn about marine engineering from him first hand. I arrived to the ship Monday evening (September 22). Since the ship wasn’t scheduled to leave port until the next day, most of the team was not on board yet. I was able to find my stateroom and get settled in. Tuesday, things started to pick up on ship. There was a dive at 9:00 to check the hull of the ship, so I had a chance to watch the divers slide into the water and later climb back out. The rest of the science team arrived just in time for lunch. I then had time to explore the ship (I found the important places: the laundry room and the gym! ), and get to know the science team a little bit better. The ship started undocking around 16:00 (4:00 pm), and we were on our way to sea. We went up to the flying bridge, the highest deck on the ship, as we left Rhode Island. It was beautiful up there as we passed by Newport and the surrounding areas. There is an old lighthouse that is now used for event spaces, and a house built up on a small rocky island. At 17:00, it was dinner time. We eat our meals in the mess, and the meals are prepared in the galley. I knew I needed to eat a good meal because my watch for the night officially started at 18:00 and would last until 24:00. The sun sets on our first day at sea. The sea was pretty calm yesterday, so it was a good introduction to the ways of life on a ship. So far, I have not had any trouble adjusting to life onboard ship. I was worried about sea-sickness, but I came prepared and have felt great so far. A lot of the crew have mentioned that I should be fine, and that I’ve already found my sea legs. I think perhaps I have found my sea stomach but not my sea legs! I do periodically lose my balance when walking through the corridors. Thankfully, there are handrails everywhere to catch my balance just in case. Maybe I’ll find my sea legs in a few more days, but I am pretty clumsy even on land! Safety drills are also an important part of sea life. Each person has their own immersion suit and personal flotation device (PFD). These are in case we have to abandon ship. We need to be able to put our immersion suit on in 60 seconds. The immersion suit is kind of like a wet suit, but it has lights on it and other tools. There are also lifeboats on board. There are three types of emergencies we need to be prepared for: abandon ship, man overboard, and fire/other emergency. Just like we have fire drills at school to help us know where to go in the case of a fire, these drills help us prepare for emergencies. You can tell a summer flounder from a winter flounder by the side the eyes are on the fish. You look at the fish as if it were swimming up right. Summer flounder eyes are on the left, and winter flounder eyes are on the right. Summer flounder are called left eyed, and winter flounder are called right eyed. 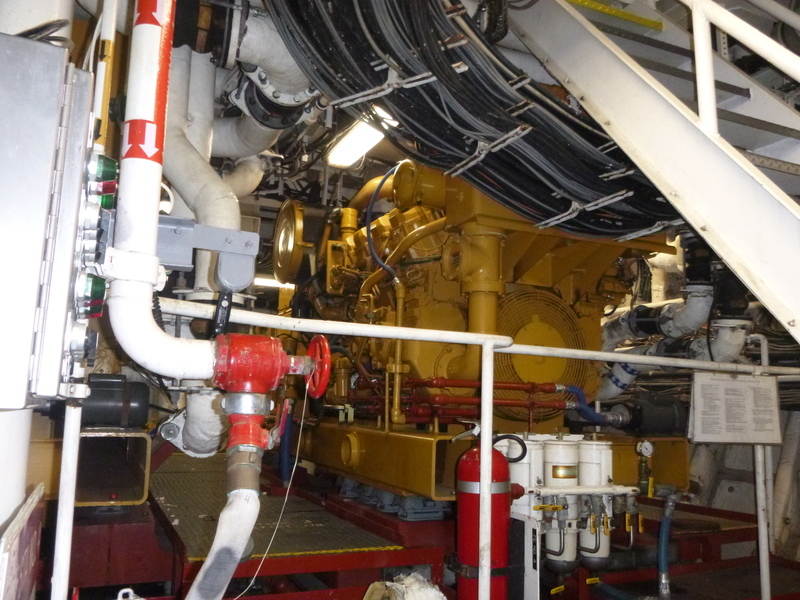 What additional information can you find out about marine engineering careers at sea? What type of training do marine engineers need, and what schools offer marine engineering? This entry was posted in 2014, Janelle Harrier-Wilson, NOAA Fisheries Service, NOAA Teacher at Sea and tagged Atlantic Ocean, Autumn Bottom Trawl Survey, noaa ship henry bigelow. Bookmark the permalink. What does the Henry Bigelow look like? How exactly does it catch the fish? @Matthew, if you want to get a good feel for the ship, take a look at the Henry Bigelow virtual tour. http://www.nefsc.noaa.gov/Bigelow/shiptour.html As for how we fish, we use nets and a sophisticated trawl system that sends the net off the back deck of the ship into the water and down to the sea floor. We stream the net for 20 minutes, and then we bring it back up and unload the net. It’s pretty cool to see it all happening! Great information and great information about STEM connections! Keep up the great work! I was curious as to why the winter and summer flounder were right or left eyed so I looked it up. Apparently, when they were younger, they weren’t flatfish yet. They had a normal type body. As they grew older, their bodies develop and one eye will move to the other side of it’s body so that both eyes are on the same side. For winter flounder, the left eye moves so that they become right eyed. For summer flounder, the right eye moves to make them left eyed. As to why different eyes move for different fish, I don’t know. @Lauren, that’s so cool that you looked up more information about flounder. Some of the scientists here suggested you Google flat fish eye migration to see a time lapse of it happening, too. Love your immersion suit! Regarding the engineer, did they recommend any particular type of training? I’m guessing high school is a “must”, but then what? So exciting! @test0622 Studies in marine engineering. I think the most opportunities would come from a four year degree, but there are also technical training programs for engineering technician. Yo wats good Ms. Wilson. Hows life in the sea. Let me know if you spot Atlantis. Hi, @Zahid. I hope everything is going well! You told us that this trip was to check on the fish population. How do you know which fish you have counted and which fish you haven’t if they’re in the same species and look identical? Can you see a lot of stars at night? And for the house that is built on the rock, isn’t it dangerous like if the water level were to rise or weather problems. How is it shielded from the splashing waters and nature? Are there any similarities between spaceflight engineering systems and boat engineering systems? Also the moonfish is really small and shiny. Do you know why they have shiny scales? And do they smooth dogfish get any bigger than that? The pictures you have of leaving port are beautiful. I especially like the sunset and the house on the rock island. I hope you don’t have to use your immersion suit, although it looks like you could hit a wall pretty hard and not feel much pain while in it. I hope you are having fun! @Gina, we fish is very different areas. Plus, a lot of the fish that we measure are no longer alive once we are done with them. They become food for other ocean animals. The stars at night are amazing! As for the house, I have no idea how they stay safe. My guess is they don’t live there year round, but I don’t know that much about it. Why do you have to work until/wake up at midnight? Why are the shifts so long? And what happens if you don’t have the right kind of fish in the bucket? Do you think it’s weird sorting through/touching the fish? Or do you just find it interesting? Did you end up taking Tyson or Toro? Woah, this is so cool! I had no idea there were summer and winter flounder! I thought it was just flounder! @Garrett, a lot. I don’t know the total. However, sometimes we’ll measure over a hundred of one species just from one station. I’m sure we’ve caught thousands and thousands of fish. Hi Mrs.Wilson that was a very interesting topic i was very interested. Did ask the scientist the one who had the night shift if he was tired? @Ali, I think everyone is a little tired at this point. There are a group of seven in the science party for each watch. When we are working during the day, the night watch is sleeping, so they are not too tired. Our chief scientist for the cruise usually works during the day. However, if there is a problem, we have to call to wake him up. Looks like you are having a great time on the Bigelow! give them a big hello from me!! I really love seeing your critter photos! Good luck Janelle!! How’s the trip? Looks like you’re having a boat load of fun. LOL I can’t wait to hear all about the trip when you get back! The sunsets there are really nice. Are you taking a lot of pictures? Would you rather have had the day or night shift? Did you get to choose? How was the ship shaped? the PDF suit was an interesting picture and i would say good luck with the night shift(it would be classified as night shift, right? ), but it already happened. Good thing you got the day shift, because I would hate to get the night shift. It would be kind of creepy, and I wouldn’t be sure how active it would be either. If I had the night shift I would probably just stay inside at the snack bar and eat all the ice cream… Well I think I would do that during the day shift as well. Why don’t dogfish have hair or fur if they’re dogs??? That was an interesting fact about flounder. IT would be cool to see what fish swim at night time. I would have free time to see how to ocean is at night time. the immersion suite seems like to one from Spy Kids. @Sergio, We really didn’t notice it as we were working. However, the lab started to smell a little as the cruise went on. We did a deep clean of the lab before we got back to port, so it was smelling better then. That Flounder was huge!!! When I went to PCB I went on a dolphin tour to see dolphins and our guide told us about the time she saw a flounder actually come up and swallow a caught grown shark! It’s insane how big they can get. @Nathan, I know! I was super surprised how big they got. noon to midnight because you are more relaxed but you would be more tired than if you just woke up and did midnight to noon. @James, for me, noon to midnight wasn’t that bad. I slept really well on the ship and didn’t usually get up until 10 am. was the immersion suit heavy? @Justin, yes it was. It was tricky to get on. same here i final found the comment section uh! well how was ur boat trip mrs.wilson? 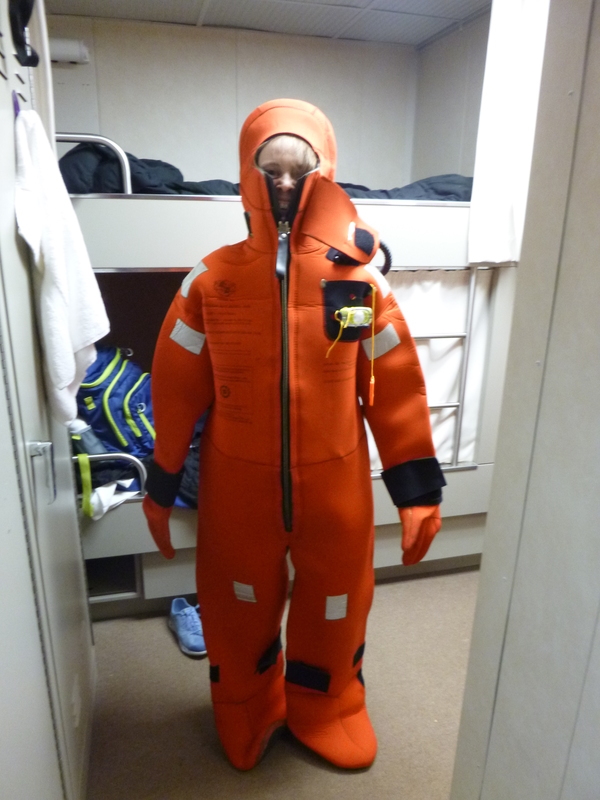 i bet u reek like fish while cutting up all them at sea lol omg the immersion suit looked really hard to put on idk if i would have been able to do it but it all looked fun. It must o been very peaceful at night with all the water movement of the waves or idk at least thats what i think?? I didn’t know that the location of eyes on flounders was generally specific to certain species. I thought it could vary similar to how humans can have different hair colors.